Carne asada, nopales, and churros are hardly what I would call a Christmas feast, given my mainstream American upbringing, but that’s exactly what we had for a Christmas dinner for deported U.S. military veterans in Ensenada, Mexico. It was delicious! This meal was provided thanks to Alfredo Figueroa, a recent UC Berkeley graduate and Army veteran who has earned several honors. One of these was the UC Berkeley Chancellor’s Award for Public Service in civic engagement for his efforts to support deported U.S. military veterans. He and a group of volunteers delivered care packages and cards to these veterans to ensure they knew they were remembered this Christmas. But what are U.S. veterans doing here in the first place? No matter how long someone has served in the military or how many combat tours they voluntarily completed, if they had not obtained their citizenship along the way and then ran afoul of the law, they can be deported to their home country. While they can still apply for veterans benefits, they cannot cross the border to get treatment at a VA hospital, even if their service-connected issues contributed to their legal troubles. For instance, they might have been arrested for illegal drug possession used to self-medicate for PTSD or chronic pain related to a service-connected injury or trauma. They then served their time in prison and were subsquently deported. They can only be returned to the U.S. for burial at a national cemetery after they die. As a veteran and a U.S. citizen, this made no sense to me. How can we possibly be treating those who were willing to risk their lives for the U.S.A. like this? Heart wrenching story after story is filled with years of family separations, lost homes, and destroyed careers along with a sense of hopelessness. And some innocent of their accused crimes wouldn’t have been deported if their lawyers hadn’t encouraged them to take a plea deal of guilty to speed up the court process. A typical example might be that of a person who was born in Mexico and brought legally to the U.S. by parents when he was a young child. As he grew up, he viewed himself as an American and wanted to serve “his” country. In signing up for a stint in the service, his recruiter gave him the impression that citizenship would accompany his enlistment. He was then discharged, and often, like so many recently discharged veterans, he floundered in readjusting to civilian life. Before he realized how much he was struggling and sought the help he needed, he committed a crime such as an assault in a bar fight. After paying his debt to society, he was nevertheless discharged to his country of origin with nothing. Is this not a form of double jeopardy? Through a combination of local programs, fundraisers, family support, and sheer fortitude, these veterans have carved out lives for themselves in a country where they often barely know the culture and for some, even the language. They have overcome extremely difficult odds to make peace with their circumstances, yet most of them would like to return to the country they served. Permitting their return will likely take an act of Congress — more specifically, the House of Representatives Bill, H.R. 3249, Repatriate Our Patriots Act. If passed, this bipartisan bill would: Create a designation for certain immigrant veterans. Protect veterans from deportation. Assist veterans to obtain U.S. citizenship. Cancel removal proceedings for veterans and allow return to lawful permanent resident status. Establish a program for deported veterans to return to the U.S. Provide access to all military benefits. Develop safeguards to identify immigrant veterans. This bill is only a beginning in terms of addressing the myriad of current cases, but it’s a good start. Thousands of U.S. immigrant veterans in the armed forces are currently not naturalized, leaving them susceptible to deportation despite their service in the military. The political makeup of Congress will be notably different in January, and perhaps this bill can finally achieve the full support it deserves. Our veterans can then be treated with the respect they have earned for their military service. You can do your part by encouraging your Congressional representatives to support our troops — all of them — leaving no man behind. 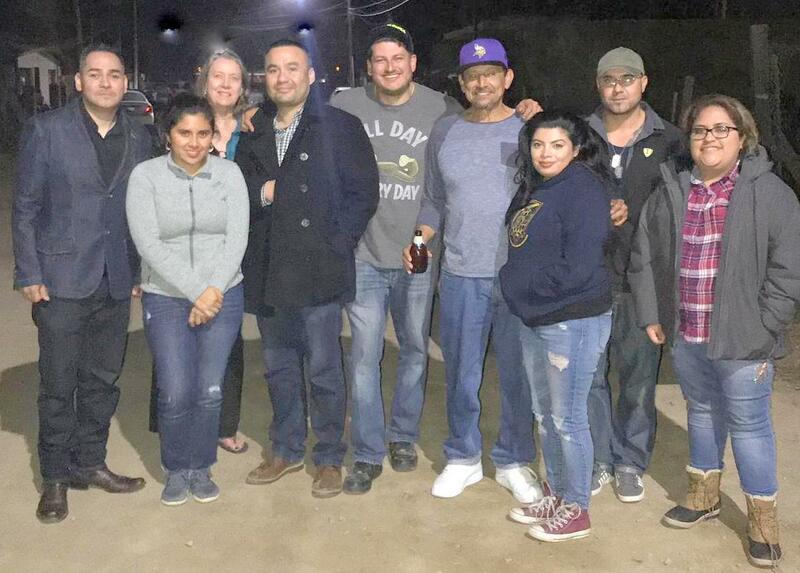 Deported veterans and volunteers who gathered for a pre-Christmas feast in Ensenada, Mexico.